Click HERE to get your very own copy of PEDIGREE. PEDIGREE is a board game currently under development that is designed to simulate animal reproduction and genetic selection in a exciting, fast-paced manner. The base game is species-neutral and includes the game board, player boards, action cards, sire markers, and money tokens. The included animal card deck will be cattle, with future decks planned for horses, dogs, sheep, goats, pigs, as well as decks for specific breeds. Using the mechanics of hand management and dice rolling, plan your matings and actions to optimize your chances of success. In PEDIGREE, animals start out as "unproven", when all you know about their quality is their appearance, also called their phenotype. After they have offspring (progeny), they become "proven", and you then know more about their genes, which is called genotype. Both phenotype and genotype are rated on a scale from 1-STAR to 5-STAR, with higher-star animals having more market value. The quality of the parents determine the quality of the offspring, and you must choose whether to play it safe by breeding proven animals or gamble with breeding unproven animals. You will battle Genetic uncertainties and health issues throughout the game. However, each player has a set of eight or nine Action Cards that you can use to mitigate these problems, as well as other actions to improve profitability or show ring success. But you won't be able to play all Action Cards at once, so you must choose which are the most important each year. 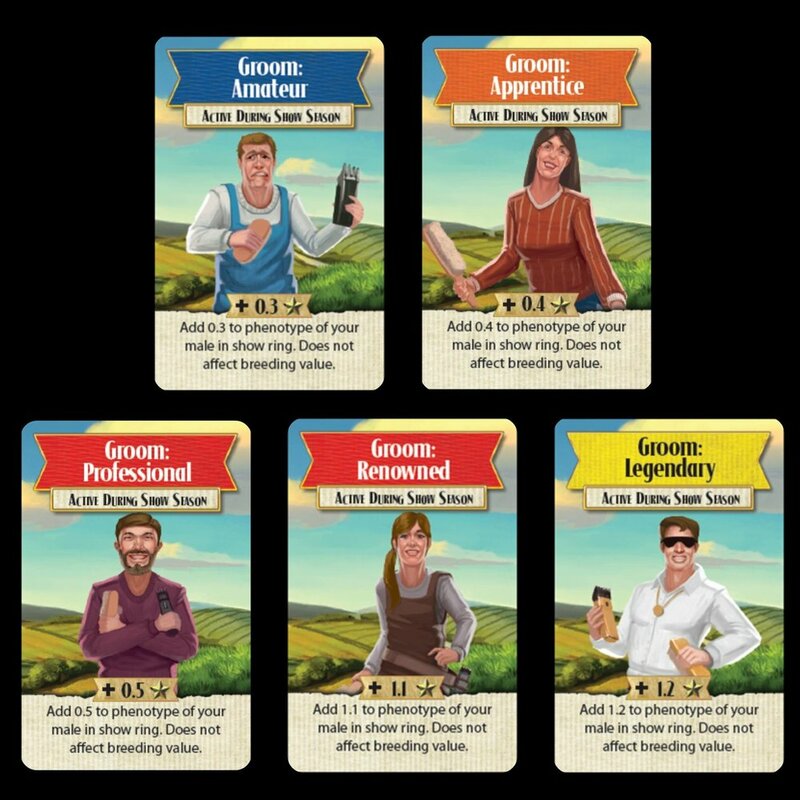 Players may choose one of four roles (Manager, Technician, Veterinarian, or Showman), each having a slightly different set of Action Cards, giving them unique player powers. Keep the best and cull the rest. Take the best offspring to The Show, win the champion trophy, and build your reputation. In PEDIGREE, players compete each year in the Show Ring for the champion trophy. The trophy doesn't bring you money in the short term, but rather, it builds up your reputation as a breeder which makes your animals worth more at the end of the game. The more trophies you win, the more valuable your animals. 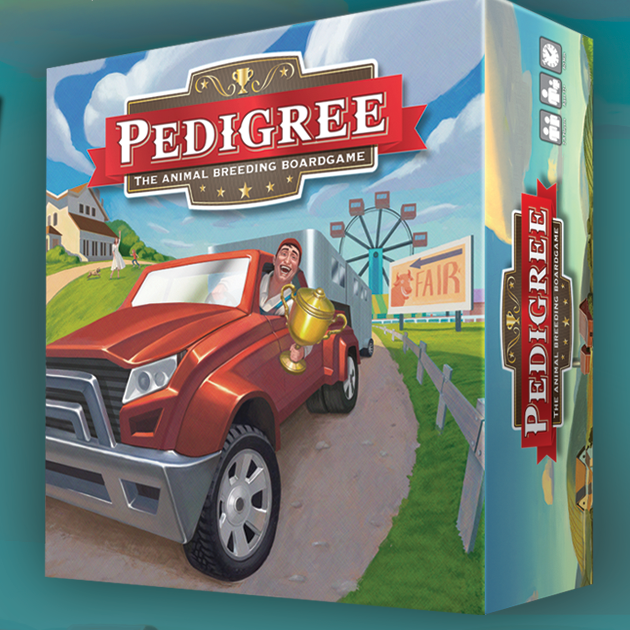 In PEDIGREE, you will buy and sell animals to the bank, as well as to and from other players through private negotiation or public auction. Once you raise a great sire, other players will pay you money for sire services to breed their females. You can also advertise, which will make your animals bring higher prices.